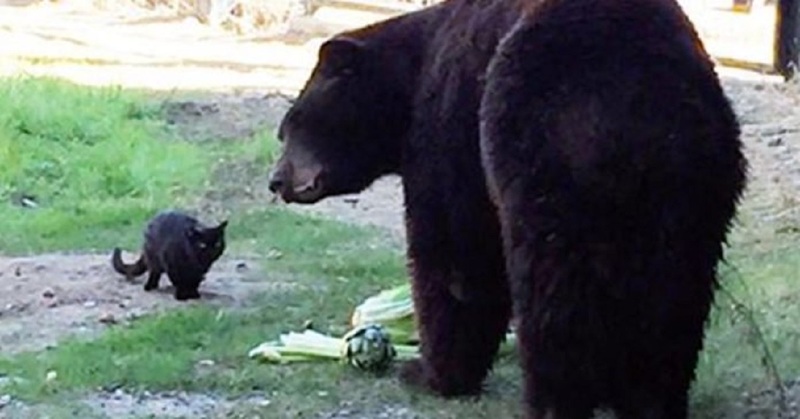 The cat(little bear) and his friend, Sequoia, a five hundred and fifty-pound bear are best friends! They both live together at a California zoo, senior zookeeper Jill Faust stated; the dog food they put out for Sequoia attracted the cat. In a UPI report, Faust stated that once they saw Little Bear was making daily visits, they put food out for her also! As you can tell, some guests in the zoo were worried for the safety and health of the cat, but, Little Bear walks right in Sequoia’s area with no anxiety, in fact, the 2 can be seen resting together after eating! Watch the full video under to see The cat and her big guy, Sequoia! This makes my heart melt! Share off, people!